Everlasting is told from the perspective of a young, aspiring filmmaker named Matt, who has put together an honest film for a school project. In his film, Matt (David) talks about Jessie (de Angelis), his recently deceased girlfriend, and his search for her killer. Along the way, Matt shows his viewers several insights into Jessie as a person – some of which he seems to be learning as well. The film relies on two intriguing, well-written and well-played characters, and features a balance of drama and thrill. Director and writer Anthony Stabley shows expertise in his chairs and creates a mystifying and emotional masterpiece. The film is truly a neo-noir, with Stabley showing masterful use of nonlinear storytelling. A key element of Jessie’s murder is that it happened after she had moved to Los Angeles, where she was pursuing a career in modeling. Matt’s retelling of the story shifts between after the tragedy, when he is trying to piece together Jessie’s murder, and before it – focusing on the road trip that the couple takes to move Jessie to LA. The latter scenes feature a voiceover narration by Matt, and they serve to reveal and explore the personalities of both him and Jessie. Although the story is really about both Matt and Jessie, Jessie is the clear subject of interest for the audience. Valentina de Angelis brings radiance and emotional honesty to the role, showing Jessie to be a strong and confident young lady, while sometimes leaking the tiniest bit of uncertainty. While much of Jessie’s intoxicating impact as a character is due to de Angelis’ moving performance, credit must also go to Stabley, who has impressively written her character and Matt’s. Matt is also a very fascinating persona, who seems to feel like a fish out of water in his high school. He’s not insecure, as many people would assume of an eyeliner-wearing teenaged boy; he’s rather steadfast in his beliefs. Like Jessie, Matt is quite multi-faceted, and Adam David does an excellent job in showing Matt’s intense love for her, his struggle with some of her darker desires, and his struggling with the fact that Jessie is moving away from him. The strong and emotive performances from these leads, and from supporting actors such as Elisabeth Röhm and Pat Healy, are a major part of the film’s success. 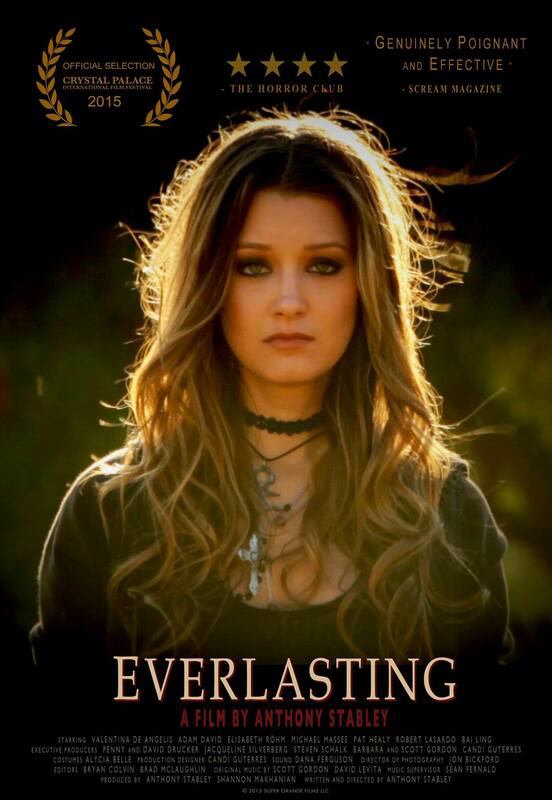 Stabley describes his film as being “about the Beauty and the Darkness that are part of our daily existence…it is the beauty of unconditional love that carries on forever” (taken from Everlasting’s official site). We can certainly feel the truth in this statement through Matt’s unconditional love for Jessie; even when he feels worried about some of her actions. And so, Stabley’s film is an overall success. Bottom Line: Everlasting is a gem in its raw, emotional honesty. Although the film is about two teenagers, the content matter and insightfulness can be appreciated by a mature audience. We will be in Hawaii, but we will watch for it. Best wishes. Exciting time for you. I don’t know this one at all.